CHP-2133-A-76 A southern cottage with a french country appeal built by Chris Achee of Achee Builders and designed by Bob Chatham Custom Home Design. 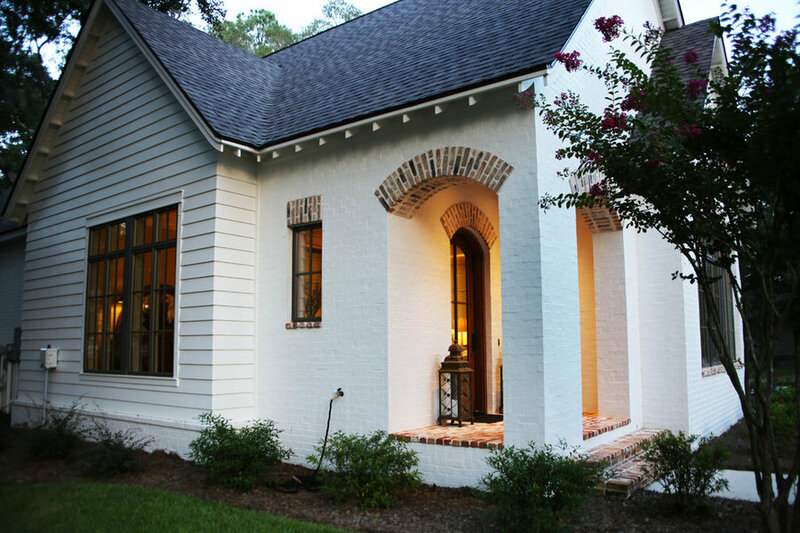 This southern cottage has a french country appeal with white painted brick, an arched entry, exposed brick trim, and brick paved patio areas. 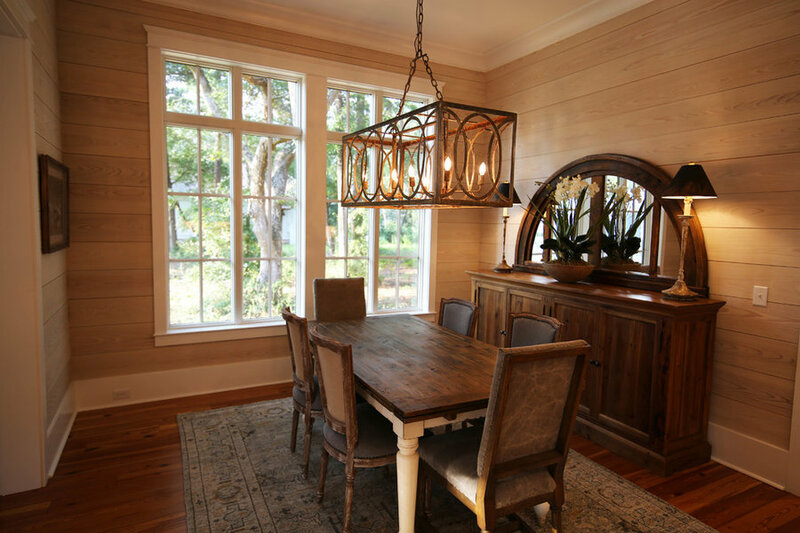 The large windows and screened in porches add a touch of southern charm. It was skillfully built by Chris Achee of Achee Builders and designed by Bob Chatham Custom Home Design. Details inside include floor to ceiling windows, cased openings, knotty pine floors, and ship lap walls. Southern cottage designed by Bob Chatham Custom Home Design and built by Chris Achee of Achee Builders. This kitchen has tall cabinets and additional storage in the kitchen island. 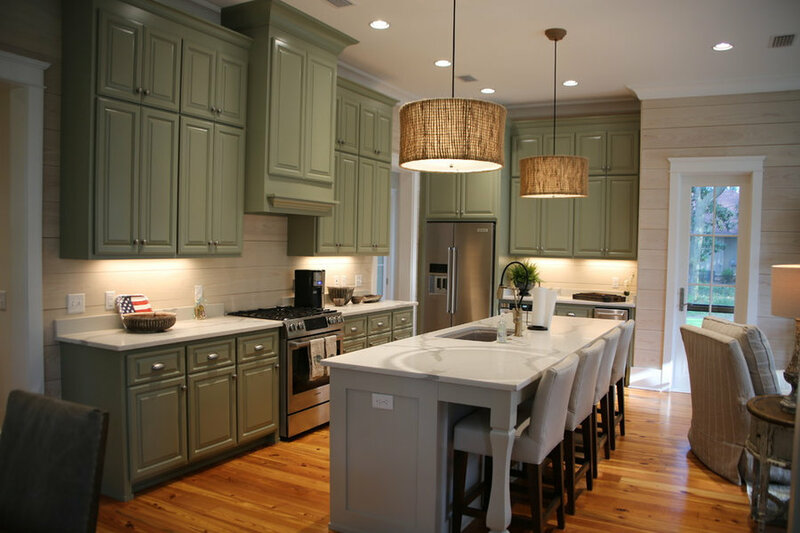 The green cabinets blend with the knotty pine floors and ship lap walls. This southern cottage was designed by Bob Chatham Custom Home Design and built by Chris Achee of Achee Builders. The separate dining room is decorated in a natural tone of ship lap and has floor to ceiling windows with beautiful white trim. This southern cottage was designed by Bob Chatham Custom Home Design and built by Chris Achee of Achee Builders. This cozy living room has large windows with transoms to provide natural light. The brick fireplace coordinates nicely with the knotty pine floors and ship lap walls. This southern cottage was designed by Bob Chatham Custom Home Design and built by Chris Achee of Achee Builders. This cottage has an open concept living room and kitchen for space and comfort. Designed by Bob Chatham Custom Home Design and built by Chris Achee of Achee Builders. 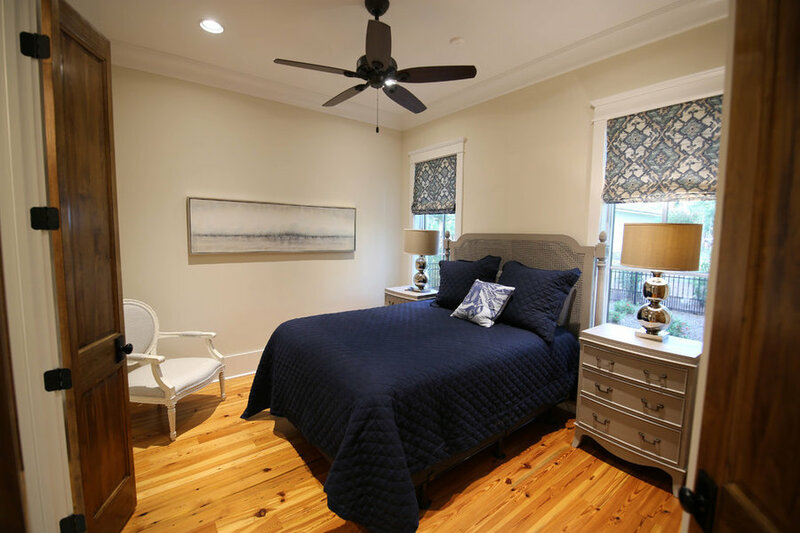 This spacious master bedroom has a private screened in porch. 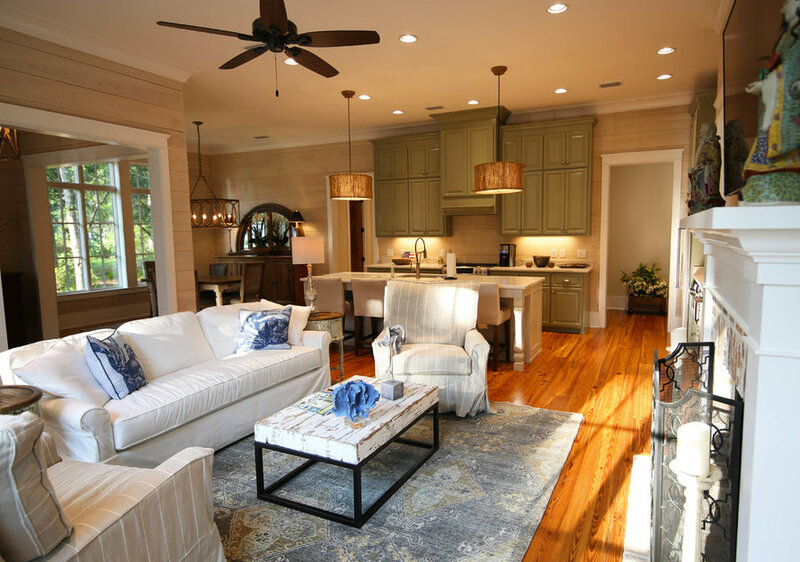 This southern cottage was designed by Bob Chatham Custom Home Design and built by Chris Achee of Achee Builders. 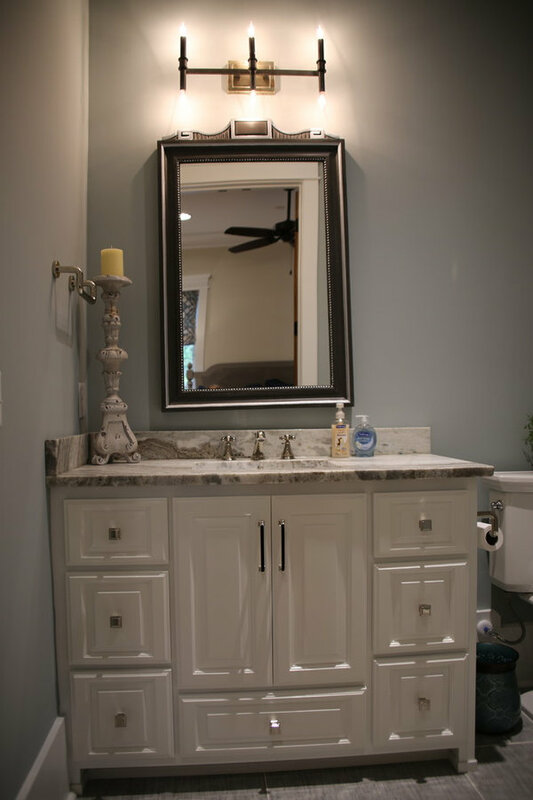 This beautiful master bathroom vanity has a modern look with sconce lighting and framed mirrors. 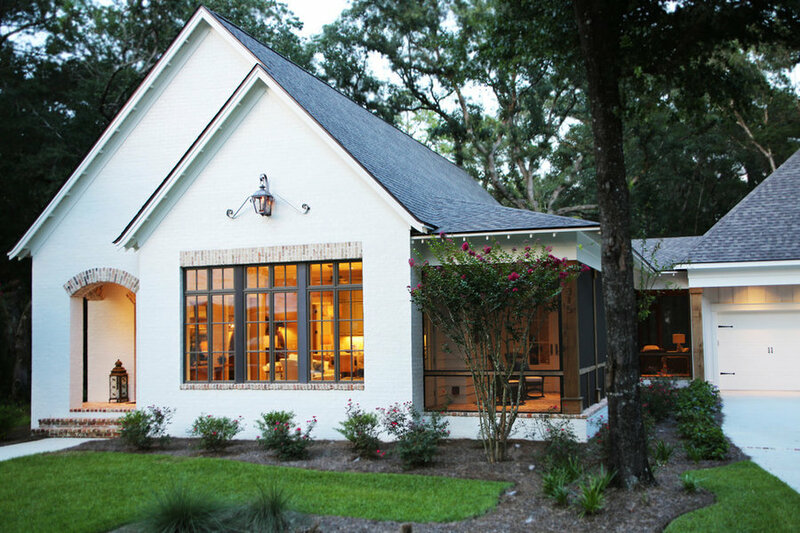 This southern cottage was built by Chris Achee of Achee Builders and designed by Bob Chatham Custom Home Design. 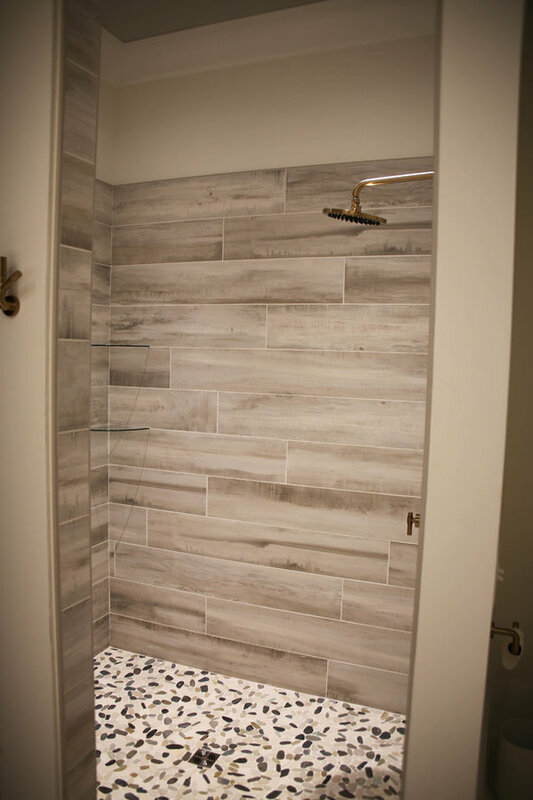 The master bathroom shower has natural appeal with a wood look tile and stone floor. 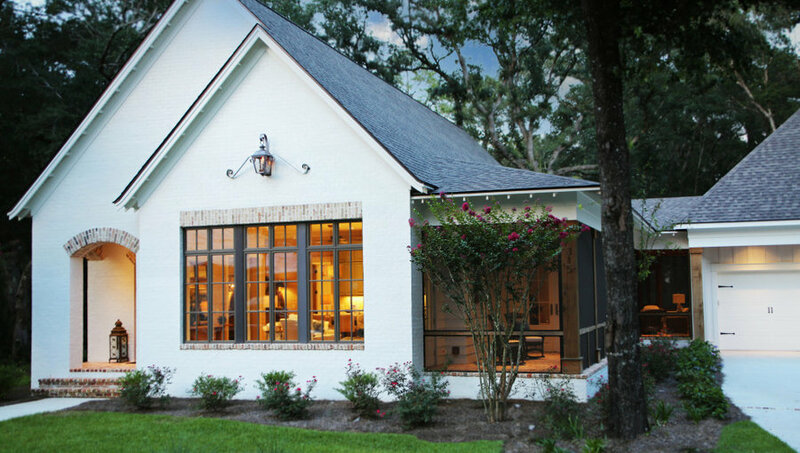 This southern cottage was built by Chris Achee of Achee Builders and designed by Bob Chatham Custom Home Design. 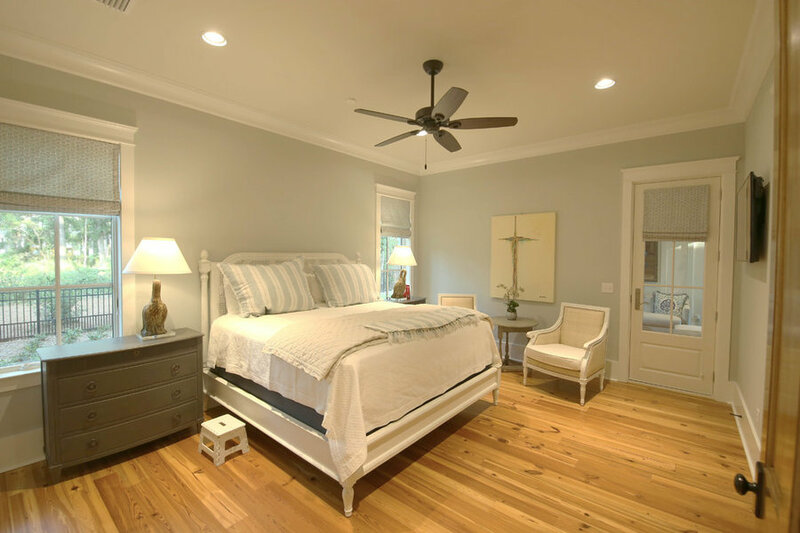 This bedroom has neutral colors and knotty pine floors . This southern cottage was built by Chris Achee of Achee Builders and designed by Bob Chatham Custom Home Design. 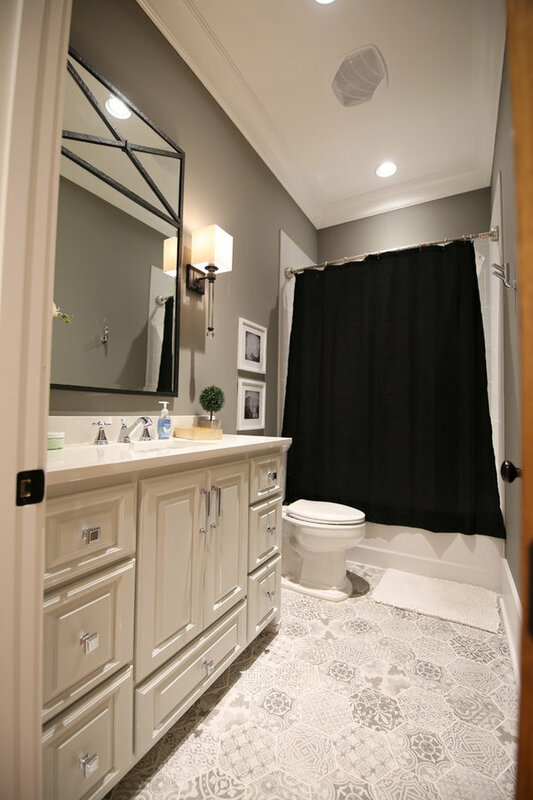 This bathroom has patterned octagonal tile, a decorative mirror and sconces and a classic gray color scheme. This southern cottage was built by Chris Achee of Achee Builders and designed by Bob Chatham Custom Home Design. 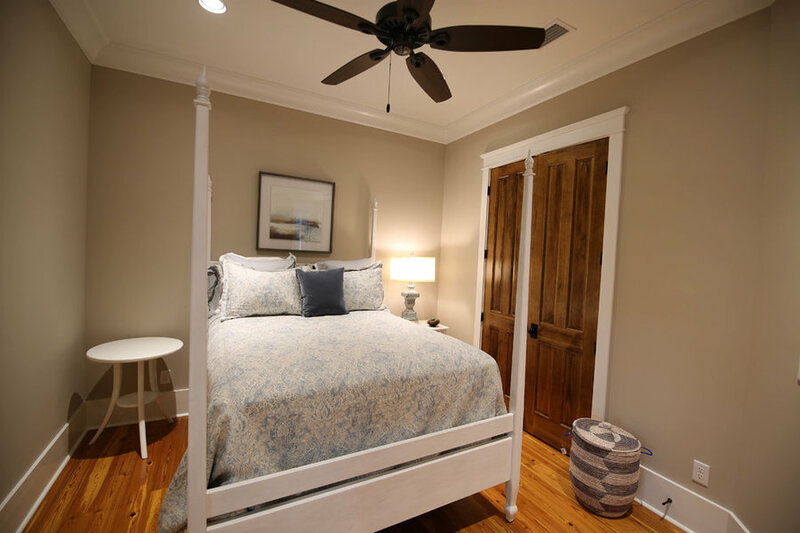 This cozy bedroom has knotty pine floors and matching closet doors for a custom look. 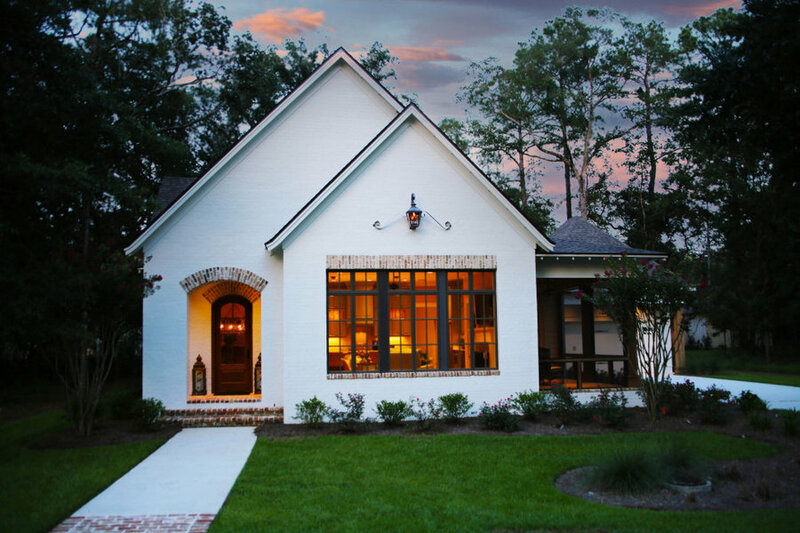 This southern cottage was built by Chris Achee of Achee Builders and designed by Bob Chatham Custom Home Design. 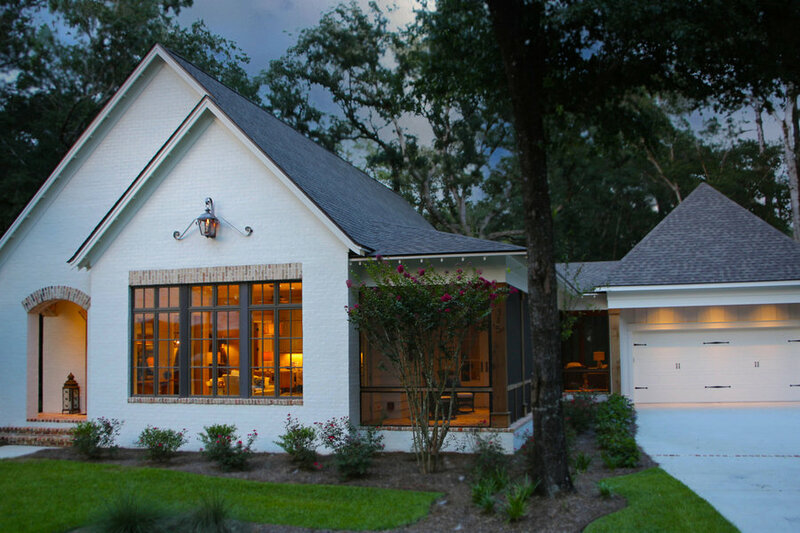 This southern cottage was built by Chris Achee of Achee Builders and designed by Bob Chatham Custom Home Design. This sun room opens to a screened in porch.. It is the perfect spot for a good book. There is plenty of light with large windows and glass doors. 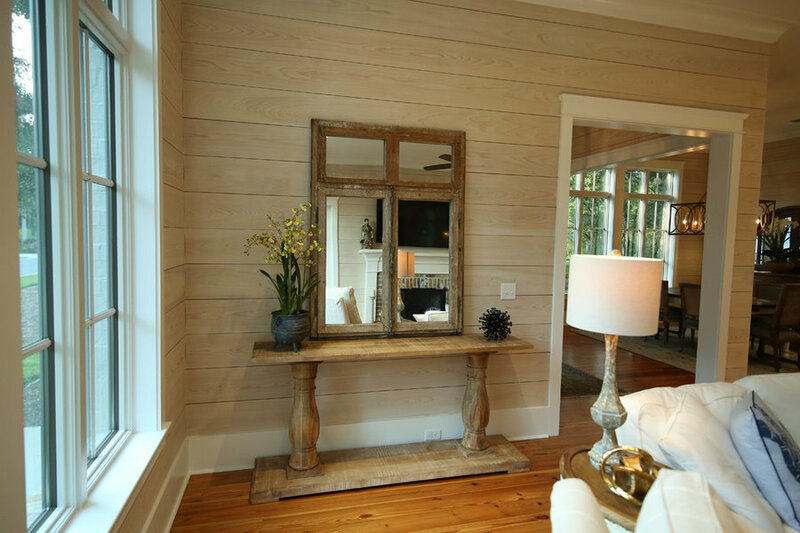 The light wood plank walls and knotty pine floors give it a timeless appeal. 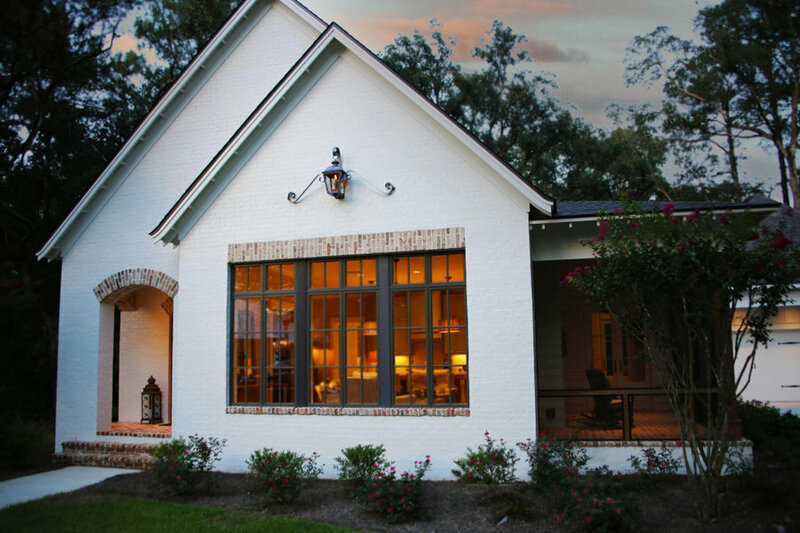 This southern cottage was built by Chris Achee of Achee Builders and designed by Bob Chatham Custom Home Design. 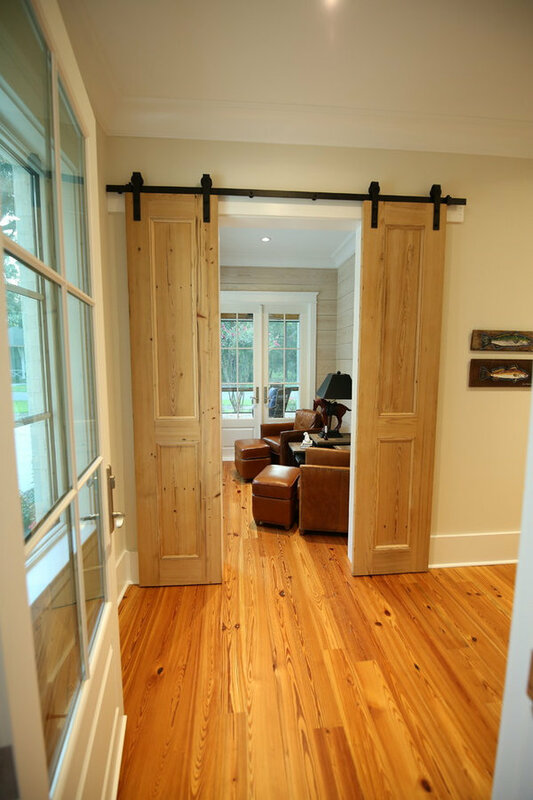 The sun room is separated from the living area with a divided sliding barn door. 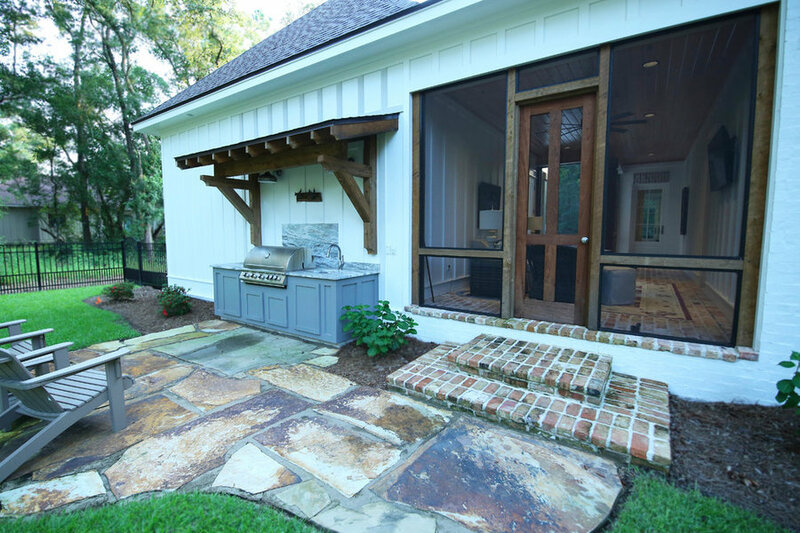 This southern cottage was built by Chris Achee of Achee Builders and designed by Bob Chatham Custom Home Design. This screened in porch has all the comfort of the indoors, while you enjoy the fresh air outside. 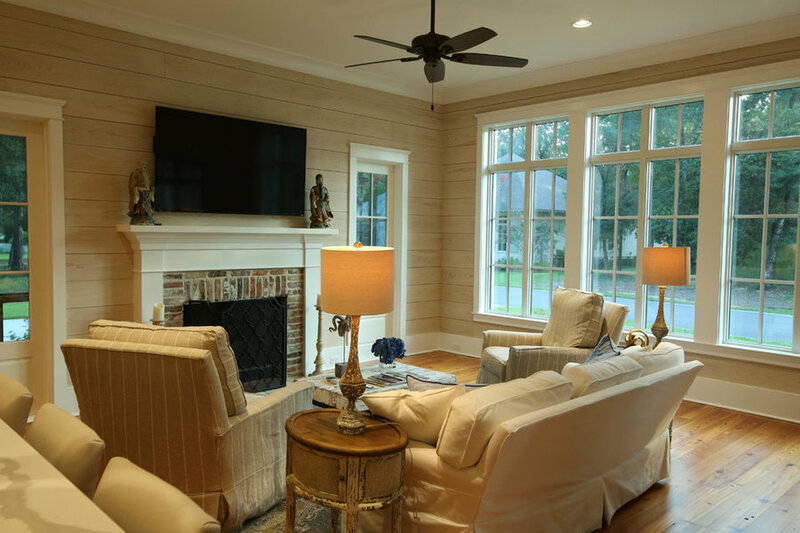 The knotty pine ceiling and brick floors against the white siding create a warm and welcoming appeal. 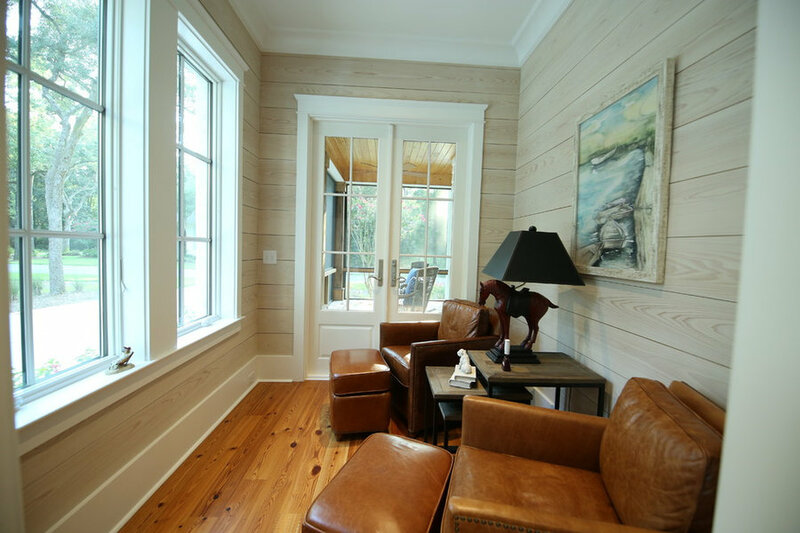 This southern cottage was built by Chris Achee of Achee Builders and designed by Bob Chatham Custom Home Design. 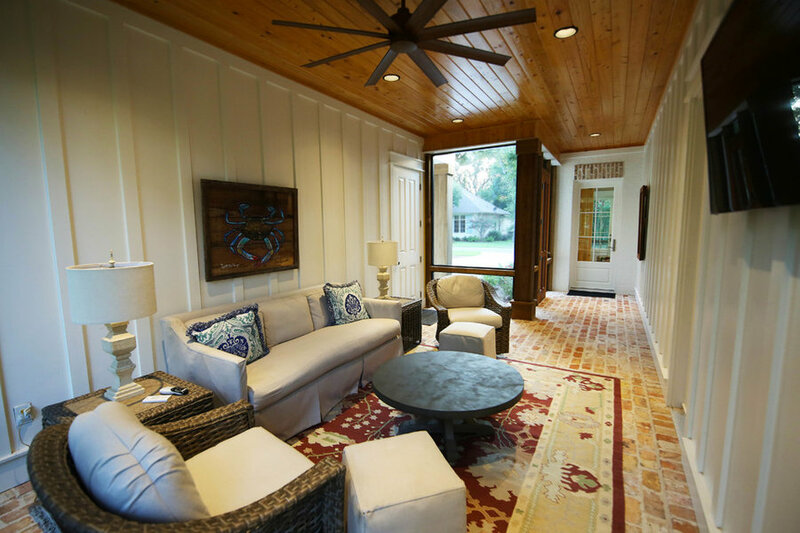 This is a side porch and one of a few indoor,/outdoor sitting areas that make this home comfortable and charming. 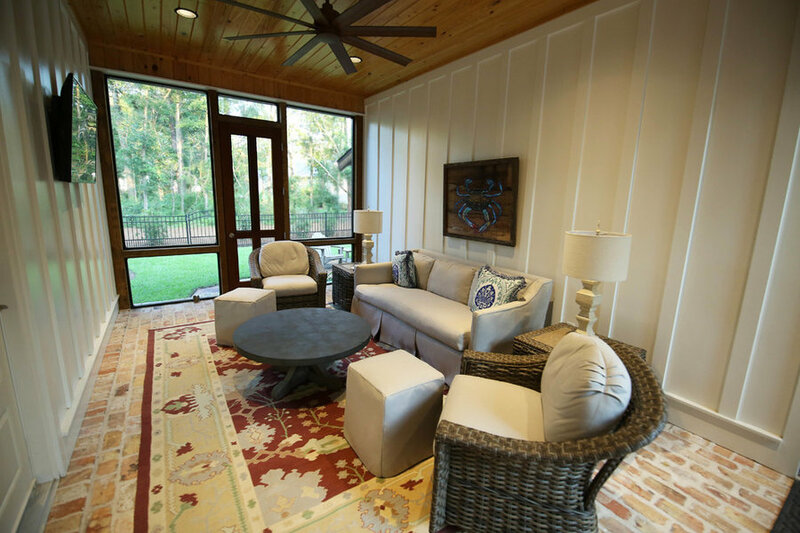 This screened in porch has all the comfort of the indoors, while you enjoy the fresh air outside. 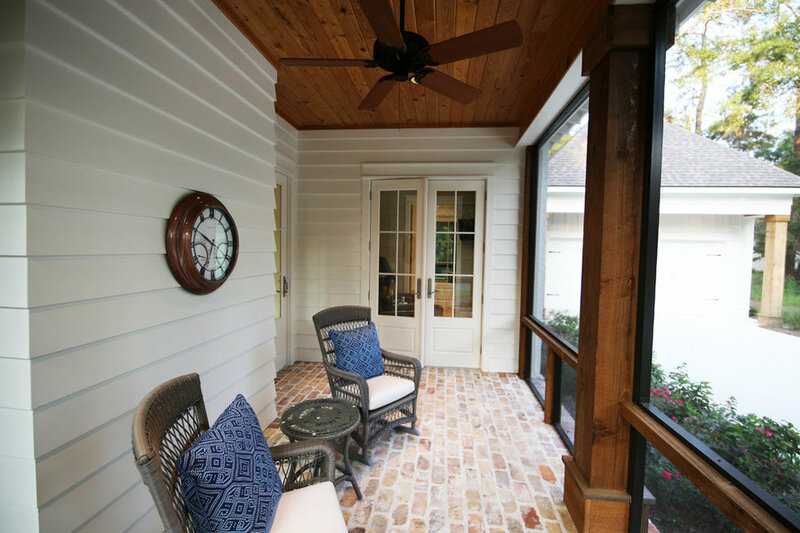 The knotty pine ceiling and brick floors against the white siding create a warm and welcoming appeal. 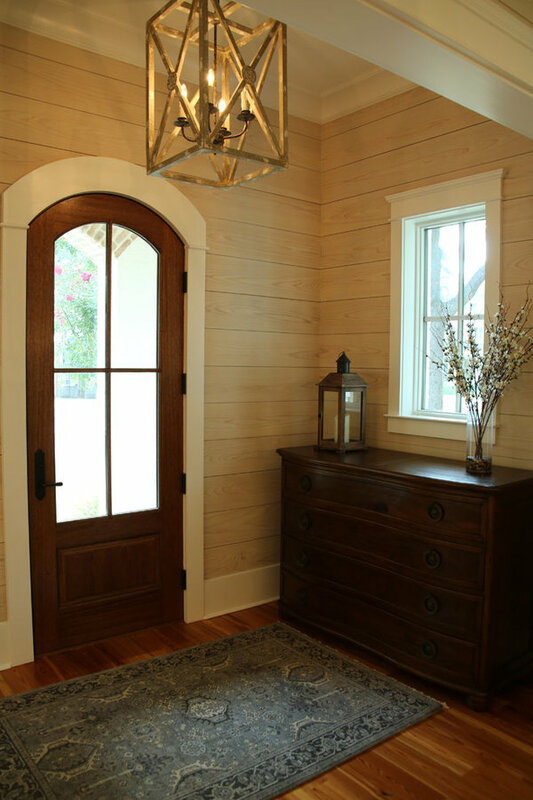 This southern cottage was built by Chris Achee of Achee Builders and designed by Bob Chatham Custom Home Design. This patio and outdoor kitchen has a small covering and opens to the screened in porch. This southern cottage has a french country appeal with white painted brick, an arched entry, exposed brick trim, and brick and stone paved patio areas. 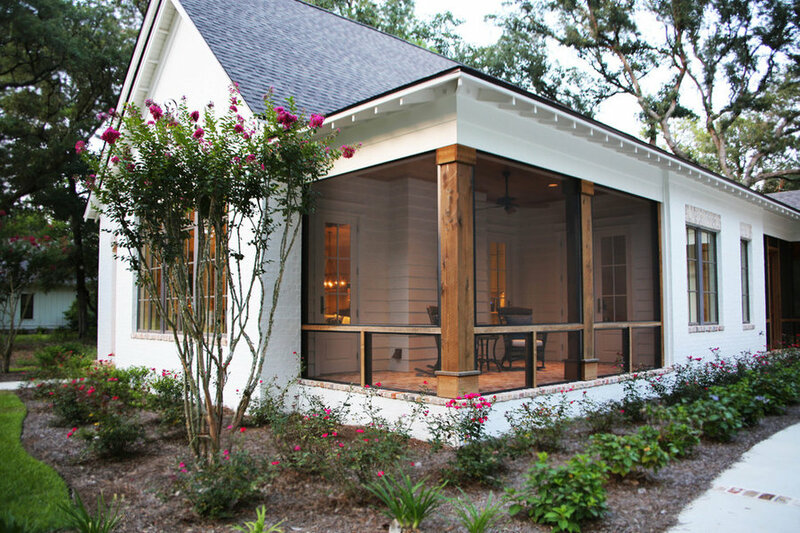 The large windows and screened in porches add a touch of southern charm. 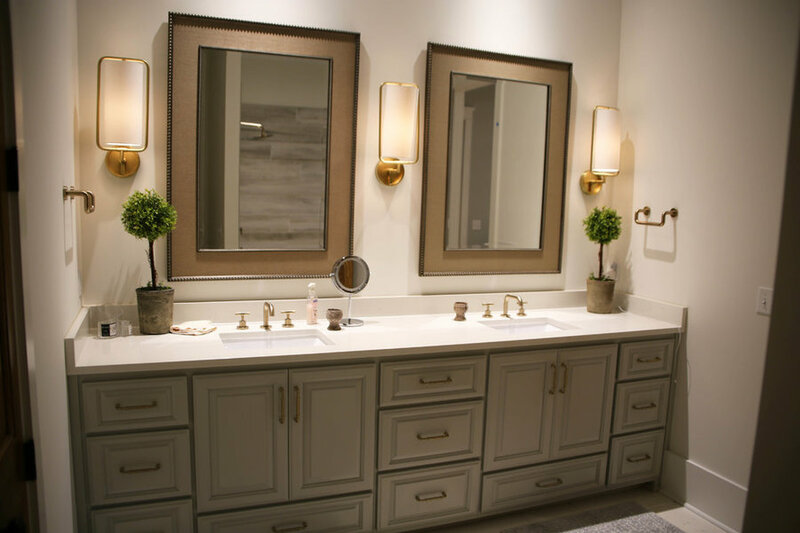 It was skillfully built by Chris Achee of Achee Builders and designed by Bob Chatham Custom Home Design.